I haven't been in Italy for Christmas for a number of years now, but on the last occasion, I sat outside with family and friends overlooking the Tuscan hills and feasting on a lamb delivered the previous day by a local shepherd. Considering that Italy is 96 per cent Catholic, it is not surprising that Christmas is treated as a very important occasion. In addition to the religious traditions, the festivities centre on spending time with friends and family – and much like in Britain, the gathering of loved ones has a heavy focus on food. The difference lies in the specifics of the meal: what foods are prepared, when they are eaten and why they are deemed special enough to earn a place in the all-important Christmas menu. The big meal for Christmas in Italy, like many other European countries, is still the Christmas Eve feast. Traditionally, Italians would fast all day on 24 December, then attend a late-night (or even midnight) Mass before returning home to the banquet that has been in intense preparation all day. These days, many are more relaxed about the rules of fasting. 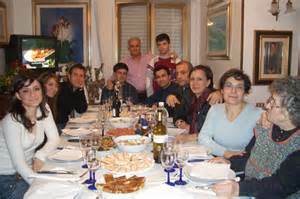 But the tradition of La Cena or Cenone della Vigilia (the elaborate night-time meal) is still very much celebrated by the vast majority of Italian families. 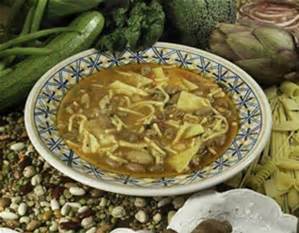 Depending on the region, the traditional recipes cooked vary enormously. In Emilia-Romagna, for example, the most typical dish for Christmas Eve consists of tortellini or cappelletti stuffed with a meaty filling, floating in a deeply flavoured, rich broth made from a capon. 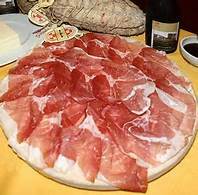 This is usually preceded by paper-thin slices of a type of very special and expensive prosciutto, culatello di Zibello, made with only the muscular part of the hind leg of pigs that were born, raised and slaughtered exclusively in specific provinces within the regions of Emilia-Romagna and Lombardia. After the tortellini, the celebrated cotechino di Modena is often served. This is a large, fresh pork sausage containing pork meat, pork fat and pork rind. After hours of boiling, it is often served with creamy mashed potatoes or lentils. Alternatively, there is bollito misto – a huge combination of different kinds of meat, offal and poultry, boiled together and served hot with mustard fruits or various sauces. This is also typical of the nearby region of Piemonte. Staying in Emilia-Romagna for dessert, you could expect to be served pane di Natale, a cake made with wine must, or pan speziale – also known as certosino – which is a typical speciality of Bologna, made with candied fruit, nuts, honey, dark chocolate and cinnamon. In Modena, the tradition is to finish the Christmas feasting with deep-fried tortelli (a larger version of tortellini) filled with custard or jam and dusted with icing sugar. 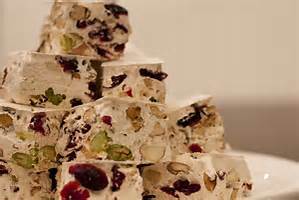 In Piemonte, you would be more likely to be served an apple mousse or a hazelnut cake, but always, without fail, the much loved torrone (nougat) of the city of Alba would be on offer. Wherever the Christmas meal is eaten, it is a special time for the family to get together and enjoy good food in harmony. Moving further south, you are likely to experience a very different meal. 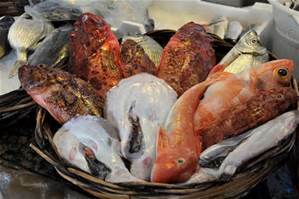 In Rome and the surrounding region of Lazio, for example, freshwater fish is traditionally served as a Christmas main course, whereas Friuli-Venezia Giulia features tripe. In the southern Basilicata, they go for 13 Christmas courses, all based on fish, whereas the Tuscan Christmas menu is often made up of game dishes. In the Abruzzi, no Cenone della Vigilia is considered complete without the soup called le virtù (the virtues), which contains meat, pasta, and dried and fresh vegetables and legumes, whereas in Sicily it is all about the swordfish. The only region that traditionally features roast turkey for Christmas on the menu is Le Marche. 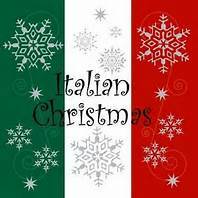 If you are looking to add a bit of Italian culture to your Christmas meal this year, there are plenty of ways to do it. The best approach is to choose a specific region and dive more deeply into their favourite Christmas dishes. Or start small and serve a butter-rich slice of softly delicious panettone (from Milan) or pandoro (from Venice) for dessert. 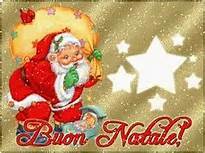 The love and attention that Italians put into their food daily is heightened for the Christmas meal. So any real Italian Christmas feast, regardless of region, will be worthy of such a special occasion. Wishing all readers and fellow bloggers a Happy and 'Real Food' Christmas. Back in the New Year! The Real Food Inspector.